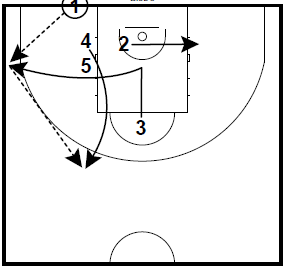 Today’s post includes a couple of baseline inbounds plays. The first one is to get your point guard isolated for a hand off in the middle of the floor. The second has two options–it can finish with a post feed or with a look at a 3 point shot after a screen the screener. These plays are a part of Coach Scott \Peterman’s Encyclopedia of motion, princeton, and ball screen offenses. There are over 2000 pages of notes on those offenses. That is among the 40 eBooks that you can choose from to Bundle in our end of 2016 eBook special. Click the link for more information about these Bundles. Each bundle contains 4 eBooks for $35. Or, you can create your own bundle by selecting any 4 Coaching Toolbox/HoopScoop eBooks that we have featured, email me what you want to [email protected] and I will put that bundle together for you and email you the information. You can also call or text 765-366-9673. You can click this link to see the complete list. 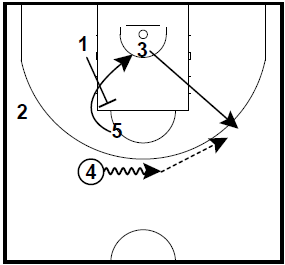 2 curls around 4 and 5 to the basket. 2 pops out to the right low block. 3 cuts to the basket and then rub off 5 to the left wing. 4 pops out to the top left guard spot. 1 passes to 3. 3 passes to 4. 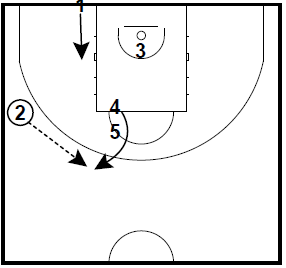 5 sets a down screen for 1. 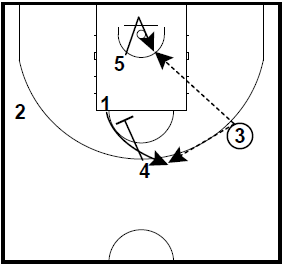 1 attacks the right side of the lane. 3 slides up to the left wing. 2 pops out to the right corner. 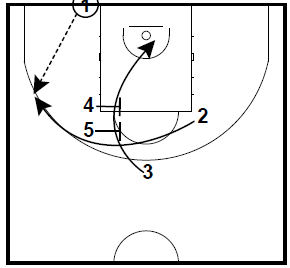 4 and 5 set a double cross screen. 3 cuts to the basket. 2 cuts to the left wing. 4 curls around 5 to the top left guard spot. 1 steps into the left low block. 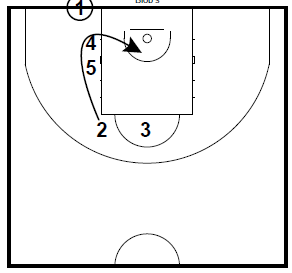 1 sets a backscreen on 5. 5 cuts to the basket. 3 pops out to the right wing. 4 dribbles to the right side and passes to 3. 5 dives into the post and seals his defender. 4 sets a downscreen for 1. 1 cuts to the top of the key. 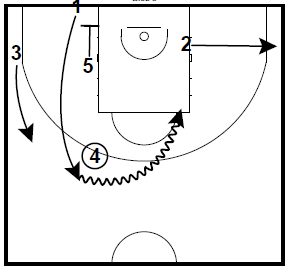 3 can pass to 5 on the post-up or 1 for the shot.